Meat makes a meal, so goes the saying. But with more people than ever before ditching meat for plant-based alternatives, it seems meaty dishes are starting to go out of fashion. An estimated 29 percent of evening meals contained no meat or fish in 2017, according to UK market research. And the reason for this is often linked to health. Research shows that eating red and processed meat is associated with an increased risk of heart disease, type 2 diabetes, and bowel cancer. Livestock production is also bad for the environment. It leads to deforestation, pollution of water, and emits greenhouse gases that heat up our planet. This environmental impact also takes a toll on human health – for example, a warmer climate enables malaria-carrying mosquitoes to spread faster and wider. But despite the rise of lower meat diets, scientists continue to call for more people to reduce their meat consumption, which is essential to meet environmental and climate change targets. It might seem like encouraging people to eat less meat is a no-brainer: just provide information about the implications of eating meat and people will start eating less of it. But in our recent paper published in the International Journal of Behavioral Nutrition and Physical Activity, we found no evidence that simply providing information about the health or environmental implications of eating meat cuts the meat on people’s plates. This might be because our everyday food choices are rarely driven by what’s known as our “Einstein Brain System,” which makes us behave rationally and in line with what we know about the pros and cons of doing something. People don’t have nearly enough brain space to make such rational judgements every time they choose what to eat. So when it comes to deciding between a ham or a hummus sandwich, the odds are we won’t base this decision on the information we just read in the latest climate change report. Instead, these routine food choices are typically driven by what can be termed our “Homer Simpson Brain System” – named after the cartoon character famed for making impulsive decisions. This system is designed to save brain space by allowing our surroundings to be the guide to what we eat. In a review we also published in the Lancet Planetary Health we aimed to understand how the settings in which people typically eat or buy food can be changed to reduce meat consumption. This research is still at its early stages, but already there are some interesting findings indicating what might work. Reducing the default portion size of meat products is a promising way forward. One study found that downsizing the default portion size of meat dishes in restaurants got each customer to consume on average 28g less meat in these dishes, without affecting their overall restaurant experience. Another study found that adding smaller sausages to supermarket shelves was linked with a 13 percent reduction in meat purchases. So, simply making smaller meat portions available in supermarkets could also help to cut down meat consumption. How foods are displayed on restaurant menus also makes a difference. Research has shown that creating an exclusive vegetarian section at the end of a restaurant menu actually reduces the likelihood of people trying plant-based foods. Instead, displaying the meat options on a separate restaurant board and only keeping plant-based options on the default paper menu made people four times more likely to go with a meat-free option, according to a study conducted in a simulated canteen. Research showed that making veggie options more visible than meat at the counter of a university canteen was linked with a 6 percent increase in the selection of meat-free dishes. And when it comes to a buffet setup, placing the meat options at the end of the aisle is probably the way to go. One small study found that this buffet layout could cut people’s meat intakes by up to 20 percent. But given the small sample size, more research is needed to corroborate this finding. Reminding people of where meat actually comes from can also make quite a difference to how much meat people end up eating. Research shows, for example, that presenting the image of a pork roast with the pig’s head still attached increases people’s demand for a plant-based alternative. Of course, making vegetarian dishes delicious sounding enough to compete with meat ones seems like a good idea. And a recent study found that increasing the look and appeal of meat-free options on the menu of a simulated university cafeteria doubled the amount of people who selected meat-free meals over traditional meat dishes. 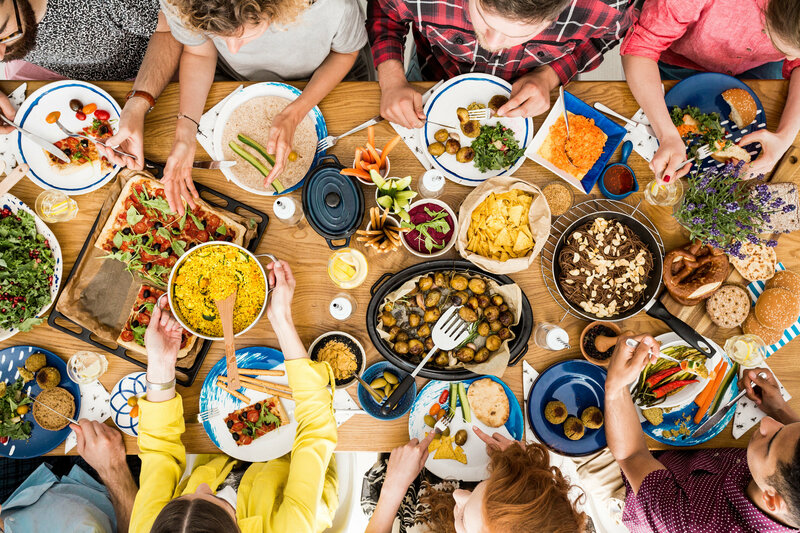 So while it’s still early days and much more research needs to be done to understand how to encourage people to eat less meat, ultimately, making meat-free options more appealing will be key to reducing long-term meat consumption. « Previous Article Is Trump pushing health insurance innovation or an ACA rollback?